White-striped crosswalks are supposed to make drivers slow down, watch out for pedestrians (and maybe even get out of their vehicle and reenact the cover art of the Beatles' Abbey Road every once in a while). But research has shown that people ignore them, often with devastating effects. Now, a city in India is working with artists to add dimension to the usual lines to curb accidents in high traffic zones. India has population of over 1.2 billion people. It also leads the word in car accidents, with over 130,000 road-related deaths each year according to the World Health Organization (WHO). To combat this problem and save lives, India's union minister of road transport and highways, Nitin Gadkari and his team are thinking creatively. In 2016, two cities were chosen for pilot programs to replace standard crosswalks in high traffic areas (around schools, for example) with 3D painted crosswalks. The concept was actually inspired by a street art trend that started a few years back, where artists were causing their own sort of "traffic" with 3D drawings in public spaces. Though 3D street art started out as an independent phenomenon, advertisers soon got on board, and commissioned artists to create images for promotional campaigns. Cities in China, New Zealand, Europe, and the U.S. have also experimented with the designs' potential to slow traffic, but it hasn't been adapted for wider use. 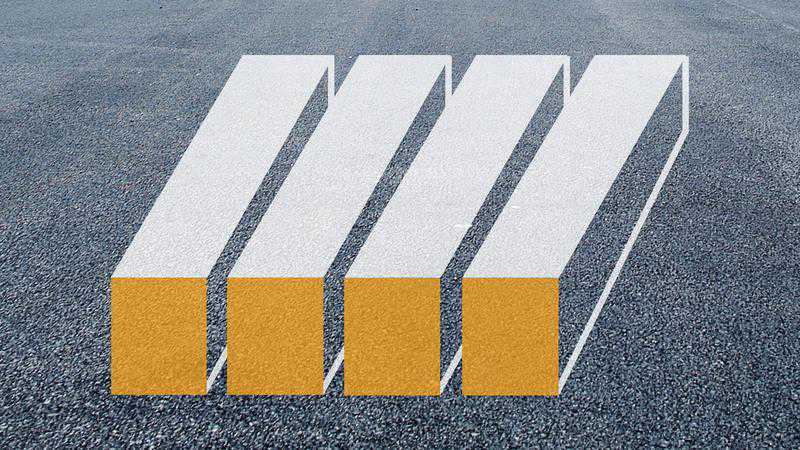 The way the optical illusion works is simple: At a distance, the crosswalk appears to be 3D, causing the driver to slow down. But as they get closer, it's apparent the image is flat, so they continue to drive through without braking (which has led to accidents when physical speed barriers have been used). Skeptics question the long-term potential of 3D-painted crosswalks to reduce a significant numbers of deaths (will drivers stop slowing down once they get used to the new look?). But the results so far have shown promise. As a bonus, the cost of painting 3D designs is about the same as painting traditional crosswalks. If India's program proves successful, 3D crosswalks could eventually be a familiar sight in high-traffic zones around the world.